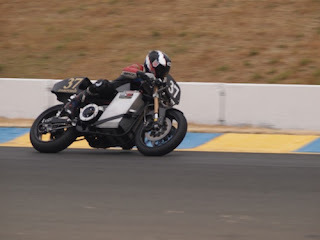 As we gear up for the 2012 TTXGP North America season opening race at Infineon Raceway, we learn that Moto-Electra Racing will not be at the race. In a note on the teams Facebook page, Moto-Electric Racing team owner Brian Richardson posted a note (see text below) about their plans for the 2012 TTXGP racing season explaining their absence and that the team still intends to qualify for the 2012 TTXGP Championship race in Daytona. This story is worth retelling some history, most of which is told in the video below, and which I was present to witness. 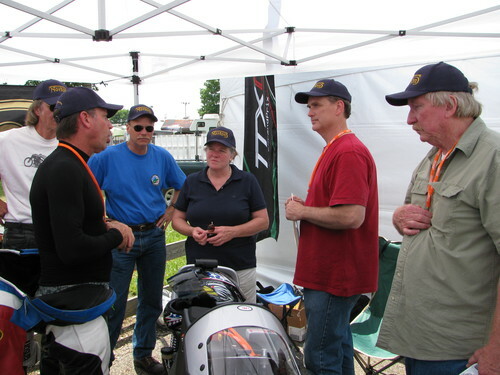 I first met the team (then called Team Electra, IIRC) in July 2009 at the Mid-Ohio race track. 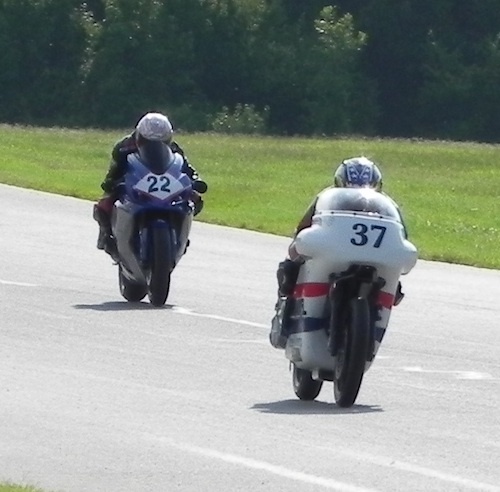 I've never spent any time at race tracks, but because of the TTXGP race held in June 2009 that year I'd gotten the bug to see electric motorcycle racing. The TTXGP team came to the Vintage Motorcycle Days event that's held every year at Mid-Ohio, and therefore I went to the event, to see what I could see, and write up some news articles. Brian Richardson, Thad Wolff, Rob Prins, and others of that team were among the couple dozen people from various teams who showed up. They were one of two teams whose bikes had a significant fairing of this sort. 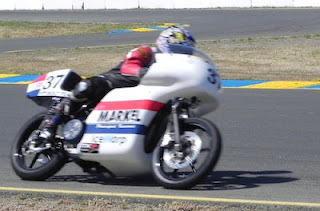 At the time I'd been reading carefully Craig Vetter website and his discussion of fairings and aerodynamics, and was excited to see two bikes using fairings of this sort. Unfortunately this sort of fairing is no longer legal in motorcycle racing and is no longer fashionable for motorcycles at all. I next met Brian, Thad and the rest of the team the next May, at the 2010 TTXGP North America season opening race at Infineon Raceway. By then they had redone the bike, using a new fairing. Notice that the front wheel is uncovered. That's what it takes nowadays to be a legal fairing, but it has worse aerodynamics than the previous fairing. Fairings and aerodynamics aren't the point of this however. 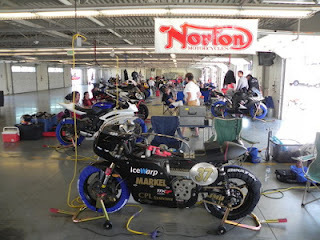 Underneath the fairing was a vintage Norton Featherbed motorcycle frame, which is part of the story about this team. That they've married old technology (Norton Featherbed motorcycle) with the newest of electric drive train and battery technology. And done it on a shoestring budget, out of a former sheep barn turned motorcycle shop in a very rural part of Virginia. There was an important thing which occurred that weekend that shows Brian Richardson's character. During the actual race Thad Wolff was riding the bike very well and was on a time to make a strong 3rd place or maybe 2nd place, but in lap 3 (?) the bike failed and pulled to the side of the track. It turned out what happened is a set screw failed, and because this set screw held in place a gizmo that helped the controller drive the motor, the bike stopped completely. Set screws are the tiniest of parts, but sometimes it is the small things that topple a machine. This meant that Brian Richardson had driven all the way from Virginia to California, to not even finish the race. He was understandably sad, frustrated, maybe even depressed, and when I talked with him he looked unlikely to come to another race. But, by the next race at the Race America track in Wisconsin, he was back in the game. Throughout the TTXGP history I've seen Brian Richardson take setback after setback, and come back to race again and again. 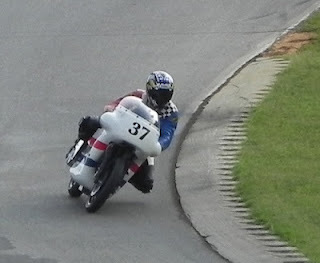 His commitment to racing with his electric motorcycle is demonstrated by the lengths he had to drive to get to the races. To participate, to keep his skin in the game, meant several cross country drives because while Brian is based in the Blue Ridge Mountains in Virginia most of the TTXGP races were held far far away. The team raced in the 2010 and 2011 TTXGP seasons, as well as the joint TTXGP and FIM e-Power race in 2011 at the Laguna Seca Raceway. In the fall of 2010 the team made a bit of history by being the first electric race bike to enter a gas bike race. Not only did they enter, but they won convincingly, starting from the very end of the grid and by the end of the race were so far in front that the gas bikes were nowhere to be seen. By the 2011 season the bike had changed again. Notice the lack of a fairing. That was because of a little accident the weekend of that first race, that messed up the new fairing Brian had built. The 2011 season rather than use a vintage Norton Featherbed frame, he went with a newly manufactured frame on the same dimensions as the vintage frame. He also had built a very nice new fairing to go with it, but unfortunately destroyed the fairing, and had to race with a naked bike but they still took 2nd place. 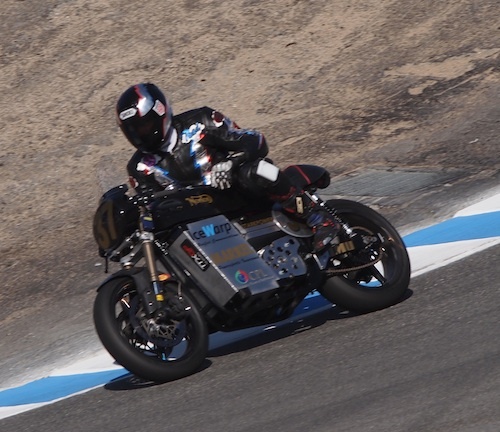 Here they are at the TTXGP/e-Power race, Laguna Seca, in the corkscrew, July 2011. 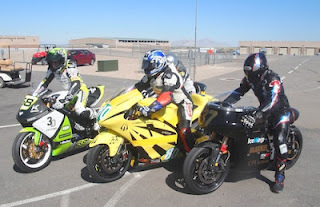 And at the TTXGP race at Miller Motorsports Park, Sept 2011. While the team did well, taking 2nd or 3rd place in almost every race, though they were never the headliner winning the race. The reason why has to do with the technological capability of other bikes fielded by other teams. While the Moto-Electra bike can easily hit 120 miles/hr or more, other teams (Lightning Motors) were able to build bikes with much more power. By the last race they weren't even in the top three, because the presence of MotoCzysz, Lightning Motors and Brammo simply outclassed their bike. It was clear that for the team to remain relevant in the TTXGP racing, that they need to up their game. The leading teams are gunning to develop bikes which can compete directly against the 600cc superbikes. While Moto-Electra has built an awesome and beautiful bike, one that I'm sure is a joy to drive around town, it was beginning to be outclassed in 2011, and I'm certain that the 2012 bikes are going to leave them in the dust. Unless, as Brian says in the note below, they get a new more powerful motor. Moto-Electra has an amazing story behind them. The choice to use a vintage Norton Featherbed frame was, as Brian Richardson explained in the video, a bit of serendipity. For his 50th birthday he developed the idea to build himself a Cafe Racer, and as he says Cafe Racers start with the Norton Featherbed frame. Halfway through the build he decided to make it an electric bike. 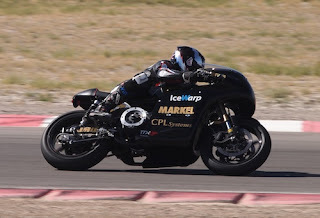 Then some time after that he heard of the TTXGP race, decided to go, and somehow connected up with Thad Wolff, who is a famous motorcycle racer with plenty of years of experience behind him. We wish Brian and his team the best and have confidence that their intention to race in the 2012 TTXGP world championship race this year will be fulfilled. 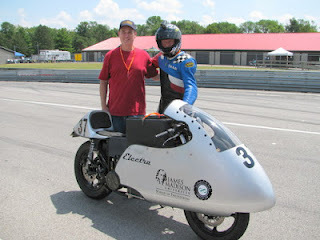 Thanks for visiting Moto-Electra Racing As you may now by now, Moto-Electra is looking for a new primary sponsor so that we can upgrade the motor and increase the voltage. We are working with a design change that would provide us with 50% more hp and 30% more torque, using an oil cooled motor. Although we are sitting out the first part of the 2012 TTXGP series, it has always been our desire to compete in the World Championships. This year they are in the USA (Daytona). Hopefully we will find a new primary sponsor to take us to the next level, and get our old bike ready for the last race of the season so that we can qualify for the grid at Daytona. We need your help to keep our old Norton in the hunt. 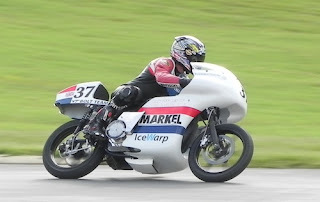 With the changes, we feel like the Moto-Electra could be ready for an Isle of Man appearance in 2013. Could a frame designed in 1949 (Norton Featherbed) beat the best in the world? The underdog -- Yes; but the Moto-Electra Team has always expected to win -- that's never changed. Thanks for being there to report on the first two years of TTXGP racing. As Thad said, "Some day we may look back at this time as a significant turning point in history". If that's true, we sure were lucky to have someone like you to keep that history. Will this be considered the golden age of electric vehicle racing? The good old days are now, and you are the keeper of our memories. It seems to me a great idea, even though it requires a lot of time and resources. I am the follower of job done by self, of course if you able to do it. That's why you tentative to convert your recent restored go kart into electric vehicle sounds very interesting.